I would like to express my deepest gratitude to Bob Weir of the Grateful Dead. His faithful support and teachings helped make this manual possible. Twenty years ago Ashtanga yoga was very much a fringe activity. Our small, dedicated group of students in Encinitas, California were mostly young, hippie types with little money and few material possessions. We did have one precious thing – Ashtanga practice, which we all knew was very powerful and deeply transformative. Practicing together created a unique and magical bond, a real sense of family. Over the years the Ashtanga family has grown considerably throughout the world and I’ve had the opportunity to share the practice with many wonderful people as both a student and teacher. In Austin, Texas I met Larry Schultz 15 years ago when he was just beginning his Ashtanga practice with my teacher, Pattabhi Jois. Even though the practice was very challenging for him, Larry approached it with great enthusiasm, optimism, and gratitude. He, like so many others, recognized immediately that this was exactly what he had been looking for and was very excited by both the practice and the people involved in it. Larry and I have become close friends over the years and together we have witnessed the profound positive impact the Ashtanga practice has had on hundreds of people’s lives, particularly our own. We have developed many wonderful friendships within the Ashtanga family and feel truly blessed to be able to share the practice with others. Motivated by this desire to share the practice, Larry opened It’s Yoga in 1991, which has become one of the largest and most successful yoga schools in San Francisco. Thus began Larry’s process of creating this manual, which has now been completed with the help of several friends. Now, happily when beginning students ask for a practice guide we can offer them this excellent, practical, and informative manual. The basics of ashtanga yoga cannot be learned enough. Because yoga practice is progressive it is important to go through this manual in the order it is presented. However, if you are having difficulty with any of the postures go back to the beginning. Keep in mind that the true source of understanding is in the basic principals underlying the asanas. Take your time and learn the fundamentals of the practice. Go slowly. Never force or push yourself into a posture, be patient, and all will come in time. What’s the rush? Most of all, have fun! Enjoy the process of building your yoga practice and bringing peace into your life and those around you. Separateness causes suffering and union creates freedom. Yoga is union. It is the separation from our Self, each other, nature, and from something greater or higher (be it God, universal consciousness, or whatever term you want to use) that causes the anxiety and chaos symptomatic of our times. It is difficult for us to experience our natural connection with each other when we don’t have that connection with our own Self. Yoga connects us with an inner wisdom, in which there is no doubt as to the connection of all things. Now is the time for yoga. Yoga is a practical method of bringing peace and connectedness back into our lives. Because we are a reflection of our nervous system, the state of our nervous system dictates how we experience the world. If the nervous system is fresh and rested, the body will be healthy and the mind alert and comprehensive. As a result, our thought will be powerful and clear and our actions, which are manifested thought, will be successful and rewarding. Yoga strengthens and purifies the nervous system so it can reflect a greater degree of consciousness and our lives can become an increasingly positive force in the world. If the methods presented in this manual are practiced correctly the whole nervous system is revitalized, the body enjoys better health and more energy, the mind is rested and freed from the endless burdensome thought of future and past, and perception is restored to its primal freshness. We can actually gain back the connection to Self and others as we are released from the restricted thinking, dull mind, and negativity resulting from a strained, tired nervous system. The healthier our nervous system, the healthier our body, mind, thoughts and actions. The purpose of this manual is to make these techniques available to all who are interested in enhancing the quality of their lives from the most fundamental foundation, the inner source. The idea is to promote self-practice and self-responsibility, to offer a tool for reconnecting. This is the place where yoga truly begins in each of our own individual lives. Yoga helps you rise to the challenge of living. As the story goes, the ashtanga yoga system was reconstructed from a mysterious manuscript written on a bundle of palm leaves, the Yoga Korunta. This collection of verses on hatha yoga was discovered in the 1930’s by yoga master and Sanskrit scholar Sri Tirumalai Krishnamacharya and his disciple K. Pattabhi Jois while researching Sanskrit texts at a Calcutta university library. The manuscript is dated to be between 500 and 1,500 year old. Krishnamacharya and Jois translated and reconstructed the ashtanga yoga series (originally there were six sequences of postures) and Pattabhi Jois, with the encouragement of Krishnamacharya, took the instructions as the basis of his practice and teaching. He is still teaching this method today in Mysore, India at the age of 85. Ashtanga taught by Pattabhi Jois is a form of hatha yoga which focuses on asana (posture) and pranayama (breath control). Some people call this ashtanga vinyasa yoga in order to distinguish between Patanjali’s eightfold system and the ashtanga yoga described in this manual. It is in the very cavern of our heart that we can realize the immensity of spaces, and by controlling our own vital rhythms that we can escape the power of time. It is by reaching the source of life that we can escape the power of death. It is by exploring the unknown spheres within ourselves that we can visit the celestial and infernal worlds. — Alain Danielou. Ashtanga yoga wakes up the internal fire. It ignites the dormant flame of vital life energy within all of us. The vinyasa system works with the synchronization of deep, rhythmic breathing and movement. By linking the postures it creates a continuous flow of energy that heats up the body, bringing oxygen to the blood, nourishing the glands and internal organs, cleansing and purifying the nervous system, releasing unwanted toxins through perspiration. As the heat goes up toxins are burned up and out of the system, creating a lighter and stronger body, and a clear mind. The heat is not only a physical experience, it is an internal spiritual fire that burns through the fog of illusion and ignorance. As the internal heat goes up, not only do the toxins begin to exit the system, but another amazing thing happens; the body begins to bend and move. As Pattabhi Jois says “even iron will bend with heat.” With this freedom of movement we are able to open up areas of the body that had been previously restricted or blocked. There is a release, a feeling of lightness. It is in these places that we can discover what yoga truly is. Yoga is not just a physical exercise or some new way to pass the time or fill the emptiness, but a method of bringing life and vitality back into those areas, awareness of the deeper, inner parts of ourselves. It is a reunion with that innate wisdom that we all posess, but seem to have lost touch with. Yoga was developed as a means of acknowledging or returning to the source of life. As concentration increases, the breath, mind, body, and soul come into union, to entrainment. Ashtanga yoga is a focusing technique that joins the main life forces, beating in unison to an internal rhythm, your internal rhythm. With control of the breath, the mind becomes calm, allowing one to tap into a flow state where there is no sense of time, where externally imposed barriers dissolve and there is a sense of oneness with the universe. As focus increases, there is an effortlessness, a lightness in the harmony of movement and breathing. In many languages the words for spirit and breath are the same. In Sanskrit it’s prana, in Latin, spiritus, and in Hebrew, ruach. In Portuguese the word for taking in breath is inspiration, or spirit-in. They believe that an infant literally breathes its spirit into its body with its first breath. We breathe in life. Breath is the source of life and vitality. It is the spirit moving in rhythm in the body. When the breath wanders, the mind is unsteady, but when the breath is still, so is the mind still. — Hatha Yoga Pradipika. Breath is the fuel that feeds the internal fire, gives it life, keeps the flame going. The vital life energy, prana, is controlled by the breath. In ashtanga yoga, ujjayi breathing (victorious breath) is used to enrich prana. By breathing through the nose, with the mouth closed, the breath is felt from the throat, producing a hissing sound. This sound of the breath keeps the mind focused. As the mind begins to wander, the sound of the breath keeps bringing you back home and away from the mumbling, bumbling mind. The mind becomes focused and calm as each pose flows into the next in concert with the breath. The breath is the link between body and mind. Sit in a comfortable meditative pose or lie in savasana. Become aware of the natural breathing process and feel the air passing down through the windpipe. Slightly contract the region at the back of the throat as you do when you swallow. Inhale and exhale through the nose with the mouth closed. Make the inhalation and exhalation long, deep and controlled. Practice full yogic breathing and concentrate on the sound. Begin practicing for 3 minutes and progressively work your way up to 10 minutes. Practice as above, but fold the tongue back so that the tip of the tongue presses the back of the soft palate on the roof of the mouth. As you inhale say “sa” to yourself and as you exhale say “ha.” Repeat ten times. Inhalation and exhalation should be of equal duration, smooth and relaxed. Notice your mind wandering as you practice breathing and keep bringing your mind back to the breath. Focus on the exhalation. Notice where your breath normally stops. Increase the fullness of the exhalation. Prana is a subtle form of energy. Prana literally means “breathing forth” the universal life force. Through practicing asana and pranayama, prana is brought into and stored in the body, increasing vitality. Prana mainly flows through the body in the nadis, or nerve channels of the astral body. Prana exists as a negative energy as well as a positive energy. Prana moves upward and apana moves downward. When the two unite at the muladara chakra (base of spine) kundalini (dormant cosmic energy) is awakened. The most important nadi, or energy channel, (there are 72,000!) is the shushumna nadi which correlates to the spinal cord in the physical body. When kundalini is awakened it starts to move up the shushumna nadi, through the seven chakras toward higher states of consciousness. In ashtanga yoga there are three locks (bandhas) that are engaged throughout the practice to prevent the dissipation of, and direct the flow of prana in the body, and convert it into spiritual energy. Jalandhara bandha prevents prana from escaping the upper body. Uddiyana bandha forces prana up the shushumna nadi. Mula bandha, when engaged, prevents apana escaping from the lower body and draws it up to unite with prana. When kundalini shakti is awakened and arises from her sleep, she is the vehicle for the expansion of consciousness, enabling the individual to fully develop his innate potential and rise beyond the mundane realm of birth and death to the level of divinity. — Chela Buddhananda. Mula bandha is the force or energy created by lifting the pelvic floor and controlling the breath. It is the root lock and calls the fire within that causes everything to come alive, to move. Mula bandha increases flexibility and stimulates heat. By contracting the perineum and drawing the energy up from the base of the spine, one can intensify and direct the life energy, cultivating a sense of heightened awareness and increasing vitality. Mula bandha ignites the flame of kundalini (cosmic energy), the serpent power. By bringing awareness to the core of the body, mula bandha helps prevent injury. It guides you to move from your center, grounding you so you can become light and fluid in your yoga practice. Sit in a comfortable meditative pose, preferably siddhasana (with one foot into root chakra, see diagram). Close the eyes, make sure the body is completely relaxed and the spine is erect. For men, the area just inside the perineum has to be contracted, so it is best to concentrate on this area for a few minutes. Women should concentrate on the cervix, as it is the cervix and vaginal muscles which have to be contracted. After a few minutes of concentration, start to gradually contract and release the muscles of the perineum/cervix. Contraction should last for a few seconds. Keep the breath normal. Contract, release twentyfive times. Prepare as above. Contract the muscles of the perineum / cervix and hold. Hold the contraction for sixty seconds, then release. Practice five times. Start off with a gentle or partial contraction. Contract just a little and hold without releasing. Then contract a little more. Continue like this, gradually increasing the tension and contraction ten times until full contraction is reached. Hold the full contraction for sixty seconds and try to breathe normally. Notice what happens when you activate mula bandha. Is it possible to contract and lift the pelvic floor and breath at the same time? Try it. Take about a 30 minute period during your day and try to maintain mula bandha for the full half hour. How many times did you come out of mula bandha? The solar plexus is located just back ofthe pit of the stomach on either sideof the spinal column. The name “solar” is well bestowed upon this major nerveplexus, as it radiates energy to all partsof the body. According to the yogic textsit is the great storehouse of prana, themanipura chakra. Other Eastern cultures link it to the hara,dan tien, center of chi or ki. It’s the centerof our being from the umbilical cord toadulthood. It‘s the place where you getthat gut feeling, the intuitive sense. We’vegot to keep it healthy, tuned in and alive. Movement of shakti in the body is described as a bird. Shakti is thepersonification of the feminine form of the Divine. Through thepractice of the flying bandha, the great bird (Shakti) flies upwardwith ease, further directing the flow of prana toward higherstates of consciousness. By contracting the lower abdomen andpulling it inward and upward, toward the spine, a powerful toningeffect and internal strengthening occurs. This lifting helps pushup the diaphragm and expel the breath. Uddiyana bandha, theabdominal lock, also eliminates strain by helping to control thebreath. Control of the breath controls consciousness. Bandhas area means of extending control over the breath and thus are a meansto extend our access to consciousness. Stand with feet about two feet apart. Bend the knees slightly and rest the hands above the knees, with the thumbs facing inwards and the fingersoutwards. The spine must remain straight, not curved; the head should be kept up and eyes open. Inhale deeply through the nose, then exhale quicklythrough slightly pursed lips, but don’t be forceful. Having fully exhaled, bring the chin to the chest (jalandhara bandha), raising the shoulders. Pull theabdomen and stomach inward toward the spine and up. Hold for a few seconds. Before inhaling, relax the stomach and abdomen, raise the head andstand straight. Then inhale through the nose slowly and with control. Before repeating another round, breathe normally for a minute or two. Start withthree rounds and over a period of a few months increase to ten rounds. Sit in a comfortable cross-legged position (padmasana, siddhasana or sukhasana, depending on your flexibility). Sit on a cushion so that the buttocksare raised. Keep the palms of the hands on the knees and the spinal cord upright and straight. Eyes may be open or closed. Begin as above, practicingthree to ten rounds, concentrating on the natural breath for a minute or two between rounds. Stand up and experiment moving from the middle of your body, try walking as if there is a string attached to your navel pulling you forward. Practice the bandhas at different times during the day. Notice the effect on your energy level. Notice any fears that arise when you’re practicing the bandhas. Connect the breath, mula bandha, and uddiyana bandha, and try to relax while maintaining the locks. The combination of the breath and bandhas are all to be practiced continually throughout the yoga practice. Jalandhara bandha is the water pipe lock. It binds the network of subtle energy channels. Engaging Jalandhara bandha is useful for alleviating diseases of the throat. It also improves the quantum of prana in the thoracic region. By pressing the chin to the chest, prana is captured, preventing it from escaping the upper body. Many major nerve fibers pass through the neck; when jalandhara bandha is performed it exerts pressure on them and the flow of nervous impulses to the brain is restricted. These impulses collect in the cervical plexus, and when the bandha is released they flood into the brain. The force of these impulses helps to activate higher centers in the brain, those that function with creativity and intellect. Sit comfortably in siddhasana or padmasana. Place the palms of the hands on the knees and allow the whole body to relax. Inhale slowly and deeply through the nose and retain the breath. Lower the chin so that it touches the collarbone. At the same time, straighten the elbows and raise the shoulders. Hold the breath and the position for as long as comfortable. Then release jalandhara bandha by slowly raising the head and relaxing the shoulders. Exhale in a very slow, controlled manner. Practice five rounds, breathing normally for a few minutes between each round. Then practice five rounds with external retention (exhale and hold). Visualize the throat as a net that captures the breath as it comes up. Notice when the chin is tucked how easy it is to see your navel. Pay attention to the opening of your throat while simultaneously locking the chin. Link all the bandhas and follow the flow of breath unobstructed while maintaining the locks in the body. Notice any change in energy level or effects on your thoughts. The gaze is a focusing technique. By directing the gaze at specific points (the space just beyond the tip of the nose, between the eyebrows) the focus is directed inward. This brings more concentration and awareness into the movement. Keep the gaze soft. Urdhva drishti ou antara drishti – up to the sky (Virabhadrasana A • Warrior). Pay attention to your wandering eyes. What distracts you? Try to control the urge to look toward something moving in the distance. Gaze at the space just beyond the tip of your nose for one minute. Does sound distract your eye gaze? Smell? Notice how your senses direct your focus. At different times during the day focus your gaze at specific points (the space just beyond the tip of your nose, navel, a spot on the wall) and see what it takes to make you look away. If you look around you, you’ll notice what happens as we get older. The middle of the body begins to lose shape and collapse. Gravity is pulling us downward. Unless we are practicing some type of opposing technique, the whole solar plexus area, a major nerve center of the body, will become squashed. Not to mention the toxins that get trapped, the poor digestion that results, and the lack of oxygen to the abdominal region. Naulis, in conjunction with the bandhas, bring everything upward, inviting vitality back into the middle of the body. These techniques keep the gastro-intestinal or alimentary system balanced and functioning smoothly. Naulis massage the internal organs, acting as an internal cleansing technique. Keeping you pure and clean, naulis remove sluggishness of the stomach, intestines, and liver, bringing back upward the evercaving-in abdominal region which is crushing and suffocating internal organs as gravity pulls us down. Don’t let the fire go out. Keep the channels of the body pure and open the pathway for the oxygen to keep feeding the fire. It’s best to practice on an empty stomach in the morning. Practice as in #1, but this time after pulling the abdomen in with the exhale retention bounce the belly gently in and out, thereby massaging the internal organs. Repeat three times. Rolling – stand with legs apart, knees slightly bent with hands on thighs. Exhale and perform uddiyana bandha. Contract sides of abdomen, isolating the central muscle. Then press on alternate hands to move the muscle from one side to the other. Notice any weak or tender areas. Breathe into them and pull upward. What happens the more air you exhale? Do you feel a tighter inward contraction? Do you feel dizzy? Imagine what happens as the toxins move out of your system. Try practicing uddiyana bandha during naulis. Notice how much more control you have with the air fully exhaled. Practice naulis everyday for at least ten minutes. Most colds and viruses are breathed in through the nose. From there they work their way through our system to the throat, chest, and into the entire respiratory system. One of the most effective ways of stopping that cycle is to clean out the nasal passages. A neti pot and some lightly salted water can do the job quite thoroughly. Nasal cleansing exerts a profound physiological effect on the body and mind. On the physical level, irrigation of the nasal mucosa removes accumulated mucus from the nostrils, associated passages and sinuses, allowing air to flow without obstruction. Regular practice of neti maintains healthy secretory drainage mechanisms of the entire ear, nose and throat area. This helps to ward off colds and coughs, hay fever, and tonsillitis. It builds up resistance to various diseases of the ears, eyes, and throat. Practicing neti promotes a balance between the right and left nostrils and consequently the right and left hemispheres of the brain. This induces a state of harmony and balance throughout the entire central nervous system, and the systems governing respiratory, circulatory, digestive, and excretory functions. Using a neti pot (illustration or a small cup with a spout, a small teapot or watering can will work), fill it with warm saline water. The salt should be just enough to taste. Stand squarely, legs apart, body weight evenly distributed between the two feet and lean forward. Tilt the head to the right side and place the neti pot nozzle in the left nostril. Open the mouth slightly and breathe through the mouth only. Keep the whole body relaxed and let the water pass out through the right nostril. When you have used the water, remain bending forward, center the head and let the water run out of the nose. close the right nostril with the finger and blow gently through the left nostril so that all the remaining water comes out. Repeat, passing the water through the right nostril. Throughout the whole practice, keep breathing through the mouth and do not attempt to breathe through the nose. When blowing the nose, do not blow very hard, otherwise remaining water may be pushed into the ears. It is important to remove all the water after the practice so irritation of the sinuses and mucus membranes does not occur. Notice which nostril is blocked. Does it change from day to day? At different times during the day? After doing the neti, do you feel a sense of clarity? What happens to your hearing? Does food taste differently? What about your sense of smell? This is a time of focus. You acknowledge the space around you on which you are about to work. It should be quiet, with no interruptions. You pick a place for the feet and plant them, one by one, deliberately connecting with the earth beneath. Participation at this level is important, if the link between your body and the ground is formed there is a centered calmness. Making a time and place for your yoga is essential for maintaining a regular practice. Choose a place which is warm and where there is enough room for you to move freely. It is helpful to practice at the same time each day, the optimal times being sunrise and sunset. Choose a spot that draws you inward. Regular practice is the key to yoga. It is through practice that these seemingly impossible postures are mastered with comfort and ease within a reasonable time period. It is through practice that yoga becomes integrated in your life. Decide how much time you have to practice each day (be realistic) and how many times a week. Begin all sessions with naulis, sun salutations, standing postures, sitting postures, meditation and finish with corpse. You say a prayer. Connecting with the world of sound, you focus your attention inward. The brain is the hardest part of the body to adjust in asanas. — B. K. S. Iyengar. Asana is not a particular posture, but a state. Within the word asana itself are the connotations of strength and firmness, as well as the connotations of pleasantness and comfort. This is the balance we are trying to achieve, strength and flexibility, not only in the physical postures, but also in our mental state. Everybody is unique and their progression in yoga is going to look differently than the person next to them. It is important to allow the asanas to arise out of an internal place rather than some externally imposed idea of what the posture should look like. As long as you are working at your peak, combining breath, bandhas, and movement, and you are gaining that internal sense of stretching and strengthening, you are exactly where you need to be. In the beginning, the physical aspects of the postures will affect you the most. In time, and as you progress, you will become more aware of the flow of prana, life force, moving through your body. As your practice evolves, these subtle, but deep movements will reawaken your awareness and control of your body, leaving you both relaxed and full of energy. By flexing your quads you will notice your hamstrings get a deeper stretch. As you pull your abdominals inward and upward you can feel the lower back lengthening. Maintain a flexed contraction within the stretch by engaging the opposing muscles. Don’t sink into your knees or lock them. Always lift up the kneecap by flexing the quadriceps. Maintain awareness also of your elbows, shoulders, and wrists. The intention is to bring life energy into our bodies, for this we need awareness. Don’t fear. Pain and injury can occur when breath and mind are resisting in fear and you move in an asana mechanically. — Pattabhi Jois. Visualize yourself in the posture before moving into it. Some of our resistance is just a conditioned mental idea that we cannot do the posture. Change the mental idea. Never force it. Allow the breath to move you gradually deeper into the posture. Focus on the breath to bring lightness, ease, and fluidity into the movement. This is not about contorting your body into some frozen posture, there is always movement in the stillness. Be patient with yourself, notice that the more even your breath, the slower the breath, the easier the movement. Let the thoughts go by, notice them as just thoughts, and then let them go. Notice how persistent the mind can be. Feel the breath as an extension of the bandhas. What happens to your spine if you connect breath and bandhas as you move into a posture? And if you don’t? As you flex the front of your thigh (quadriceps), notice the extended stretch on the opposite side (hamstrings). One of the greatest obstacles is fear. Go into the resistance, allow the body to open. Surrender. Swami Rama used to say a person has one thought on inhalation and another on exhalation, so that the rate of breath determines the number of thoughts a person has. Greater number of thoughts (a faster breathing rate) decreases concentration because there are so many thoughts going on. The breath, body and mind are so closely linked, a change in one brings about a change in the other two. By developing control of your breath in certain ways, you can bring beneficial changes to your body and mind. Pranayama acts as a key, it opens the mind, freeing the nervous system of its ordinary patterns and habits. By breathing from the upper third of the respiratory system, pranayama can move blocked pathways to the brain and the nervous system, creating new patterns, roadways to the superhighway of the superconscious. Pranayama revitalizes the body, steadies the emotions, and creates great clarity of mind. Maintain the bandhas during pranayama. Place the mind in the breath. Pranayama, like asana practice, is progressive. You build upon what you’ve already done. Sit in siddhasana or padmasana. Begin with exhale, retention. We use the example of a water pot. Before you fill it up, you want to bake it until it’s strong, to seal it, especially the bottom of the pot so that it doesn’t leak. This corresponds to the exhale retention, you want to make sure that your pot will hold water before you fill it up. Connect with mula bandha, lifting the pelvic floor and uddiyana bandha, drawing the navel inward and toward the spine. At the top of the pot, you’ll want to have a stopper, so that the water doesn’t spill out. The inhale retention with jalandhara bandha (throat lock) is the stopper. You want to contain and build the prana, life force, with the bandhas, the seals that prevent leakage. With pranayama we are putting the mind in the breath. The idea is to bring the breath up through the sushumna nadi. The exhalation creates stability, grounding. It is the descent of the spirit from the subtle moving into dense movement of energy and down into the perineum. So you’re right in the location for the muladara chakra. If you can learn to follow the movement downward, then you’re there. Same with upward. Try to make the period of retention as comfortable as possible. Connect with the base of the spine, creating a straight line from the top of the head to the base of the spine. At first the exhale hold feels very unnatural. You may feel a sense of panic or fear, the emptiness of breath versus the fullness of breath. If you don’t do the bandhas, you won’t be able to do the exhale retention comfortably. Hold the retention as long as you can comfortably, start small and work up from there. A good indicator of capacity is the quality of the subsequent breath. If the inhale is a huge sucking, fast breath, then the exhale hold was too long. You don’t want the breath to have a grasping quality. Pranayama should be soothing for the system. By using the breath to move our attention within the body, we explore the evershifting flow of energy that creates our inner experience. We begin to develop a conscious familiarity with ourselves. We begin to discover the powerful intelligence that is already breathing within us. We begin Breathing into Life. — Bija Bennett. Once you get the feel for quality of breath and the bandhas you can practice this pranayama sequence. Begin with three Ujjayi breaths (three full breaths with sound). Take a deep breath in and then exhale fully. Hold the exhale. Engage mula bandha, uddiyana bandha and jalandara bandha. Begin with a 5 second hold and build from there. Repeat 3 times. Take a full inhalation and hold. Engage the bandhas. Begin with 5 second hold. Repeat three times. Inhale fully and hold 5 seconds. Exhale and hold 5 seconds. Engage all three bandhas. Repeat three times. As your abiliity to control your breathe improves, increase the seconds of the holds. Lay down and rest at the end to integrate the pranayama practice. Feel the effects on your body and mind. Ashtanga Yoga is 99% practice, 1% theory. — Pattabhi Jois. Listen to your body. Only through your own internal awareness will you come to understand when to work harder or deeper and when to move more slowly. The breath should always be louder than your internal dialogue. Never force yourself into a pose, no posture is worth injury. Take the ambition out of it. You are competing with no one. Less is more with yoga. Take your time and build your practice slowly, there is nowhere to “get” to. Set up a regular practice for yourself. Practice is the key to the entire science of yoga. Enjoy your practice. Acknowledge and receive the gift you are giving yourself. The true challenge is not can you do a handstand, but can you apply yoga to your life? Yoga truly begins when you leave the classroom.Yoga is a way of living. Every posture reflects something about our internal state. Some days you may have trouble with the balancing postures and notice you are having trouble juggling all the different things in your life. Another day you may discover you’re not as flexible as the day before, perhaps you’ve become a bit less fluid in your thinking or actions, resistant to stretching yourself a bit further. Flexibility • strength • grounded • balance • centered • clarity • lightness • wholeness • peace — these are all directly applicable, translatable to our daily lives. Nothing is separate. The path of least effort is one of union, yoga. Take the lessons of yoga and apply them to your life. By tradition, at dawn, the yogis practiced greeting the sun with a salutation. A yoga session is incomplete without it. An ideal exercise to get you moving, Suryanamaskara welcomes the new day, preparing for the asanas, heating up the body, toning up the muscles, quickening and intensifying the respiration and cardiac rhythm. The sun salutation is the foundation of your practice, it establishes the connection of movement and breath, uniting body, mind, and spirit. Not only is the sun salutation a preparation for the rest of your yoga practice, but it is a complete exercise within itself. Suryanamaskara tones up the digestive system by the alternate stretching and compression of the abdominal region. It massages the inner organs, stomach, liver, and spleen. It activates digestion and aids in reducing constipation. Synchronizing breath with movement, the lungs are thoroughly ventilated and the blood oxygenated, creating a detoxifying effect. The sun salutation steps up cardiac activity and blood flow throughout the system, which is ideal for the health of the body. By stretching and bending the spinal column, this sequence of movements tones up the nervous system. Toxins are easily eliminated through the skin, lungs, intestines, and kidneys. Immunity to disease is increased by strengthening its potential breeding ground. Concentration and the maintenance of an uninterrupted rhythm throughout the succession of the sun salutations are key. Synchronize breath with movement and connect with the rhythm, your own internal rhythm. Start by practicing three rounds.Gradually increase to five or six. Begin in Samasthiti, equal standing. Inhale, hands up, look up to the thumbs. Exhale, bend forward to Uttanasana, gaze at tip of nose. Inhale, head up, straighten spine, gaze at third eye. Exhale, bend knees, jump back (or step back) to Chaturanga dandasana. Inhale, roll up to Urdhva mukha svanasana, upward dog, gaze to sky; back and up. Exhale, lift hips back to Adho mukha svanasana, downward dog. Gaze toward navel. Hold for 5 breaths. Inhale, jump (or step) feet up between hands, gaze between eyebrows. Exhale, fold at waist to Uttanasana, gaze tip of nose. Inhale, come all the way up looking between eyebrows with spine straight, hands up, gaze at thumbs. Exhale, arms to sides, Samasthiti. Inhale, bend knees, lift arms, palms together over head, gaze at thumbs. Exhale, straighten legs to a forward bend, Uttanasana, gaze at nose. Inhale, head up, lengthen spine, gaze at third eye. Exhale, jump back to Chaturanga dandasana. Inhale, lift chest, head back to Urdhva mukha svanasana, upward facing dog, gaze at sky. Exhale, lift hips to downward facing dog, Adho mukha svanasana, gaze toward navel. Inhale, right foot forward, left heel turned inward. Virabhadrasana, lift arms, palms together. Right knee bent, left leg straight with back foot pressed into floor. Gaze at thumbs. Exhale, back to Chaturanga dandasana. Inhale, left foot forward, right foot turned in at an angle, Virabhadrasana; lift arms above head, gaze to thumbs, left knee bent. Exhale, downward dog, hold for 5 breaths, gaze toward navel. Jump feet up between hands, inhale head up, gaze between eyebrows. Exhale, bend forward crown of head towards floor, look to nose, Uttanasana. Inhale, knees bent as you come up to Utkatasana. Exhale, straighten legs, arms to side, Samasthiti. 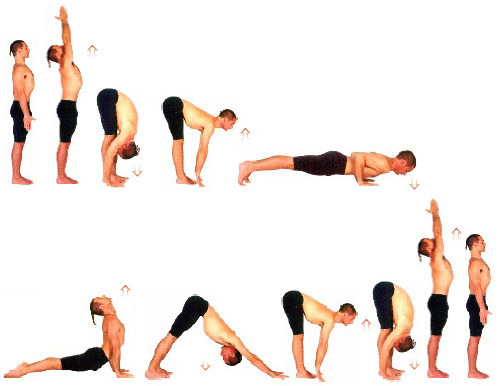 There are 6 series or sequences of postures in the ashtanga yoga system. This manual focuses on the primary, or first series, which is known as yoga chikitsa (yoga therapy). It is designed to heal, detoxify, and align the body and mind, particularly the spine. The sequencing of postures is a science, set up so that each asana provides a necessary foundation for what follows. We always begin with the sun salutations and standing postures to generate heat and connect with the breath. The first half of the primary series (which begins after the standing postures) is mostly forward bends, working the hamstrings, hips, and back. The middle section focuses on flexibility and the third part combines more flexibility with strength postures. The finishing postures are the same regardless of what series you are practicing. They are restorative postures designed for cooling down, balancing out the body, and integrating the effects of the practice. This is the vinyasa system, a breathing / moving system. Each pose flows into the next using breathing and the bandhas (locks). If you don’t have time for the whole series always begin with the sun salutations and standing postures. Work through a portion of the sitting postures and always finish with the corpse pose. If you are having difficulty with any of the postures, modify them to your ability. And keep breathing! cauko a mas to na teacher training, ci? inak dnes a aj zajtra este je tu nancy gilgoff. je uzasna! Vcera som bola na perfektnej joge u Moniky Riskovej v Starfite: http://www.yogabratislava.sk/ Monika je fakt super, venujes sa, naprava, dava pozor, proste vie co robi... takto nejako si predstavujem dobru ashtanga cvicitelku. ianus 19.04.2006 - 11:47:10 (modif: 24.10.2006 - 19:18:35), level: 1, UP NEW ! !CONTENT CHANGED!! Jump feet hip width apart (6–8 inches), feet parallel. Inhale, hands on hips, lift chest, look up and back. Exhale, bend forward, hold onto big toes with middle and index fingers. Inhale, head up, straighten back like a ski slope, arms straight, look up between eyebrows. Exhale, move crown of head towards floor, elbows out to sides. Hold posture for 5–8 breaths. Inhale, head up, look between eyebrows (only your head, don’t come all the way up yet). Exhale, slide hands under feet. Inhale, head up, look up and extend spine, place the hands as far under the feet as possible, toes come to the wrists, the back of the wrists should be on the floor and weight off the heels. Exhale, fold at waist, head towards floor. Inhale, just your head up, gaze 3rd eye. Inhale, come all the way up, spine straight. Modified posture: bend knees. Inhale, jump to right, right foot parallel to edge of mat, left heel turned inward, heels 3 ft apart. Exhale, reach out over foot and bend to right, hold big toe of right foot with first two fingers of right hand and pull up on it, creating counter tension and oppositional stretch. Turn head to look up toward left thumb, opening chest toward ceiling. Feel the rotation of the hips as the right hip moves under and the left hip rotates open. Drishti: thumb of left hand. Exhale to other side, repeat 1–3. Inhale, come up, keeping arms out to sides. Modified posture: right hand to ankle or shin or up as high as necessary to prevent straining back. If neck is strained, look to toes and then back up to thumb. Exhale, revolve around pulling left hip back, bringing left hand to the floor on the outside of the right foot, right arm up, keep shoulders moving down, away from ears. Push on floor with bottom hand while pulling up with the top hand to create counter tension. Lengthen both sides and pull lower ribs toward front. It helps to step the back foot up a bit. Drishti: thumb of right hand. On last exhale turn head to look down to hand on floor. Exhale, revolve around to the other side, repeat 1–2. Modified posture: bring both hands to the right shin, look up, spine straight. Inhale, jump to right, approximately 4 ft apart, arms out to the sides, left heel turned in, right foot parallel to edge of mat. Exhale, bend right knee over right ankle, extend right arm out as far as possible before placing it on floor outside of the right foot, either palm or finger tips, keep the pelvis tucked, open chest toward ceiling, press right knee into right arm and push on floor with back foot, feeling of being drawn and quartered. Drishti: palm of left hand. Exhale down to other side, repeat 1–3. Modified posture: right elbow on right knee instead of hand to floor, back knee on the floor if necessary. Exhale, turn to right bending right knee directly over right ankle. Bring left elbow on the outside of right knee and place hands in prayer, spiraling chest open to ceiling looking skyward. Use breath to move deeper into the posture lifting belly off of thigh. To revolve even more fully into the posture (level 2 of the pose as indicated in the drawing), reach left arm underneath right thigh and clasp wrist of right arm, always opening chest and lengthening into the twist.To extend into the full traditional pose, place your left hand to the floor outside of your right foot and spiral your right arm over your right ear. Exhale to other side, repeat 1–2. Modified posture: back knee on the floor. Inhale, jump to the right, feet approximately 4.5 ft apart, legs out to side, feet parallel, hands on hip joint. Look up and back open chest, tuck pelvis. Exhale, fold forward, lengthening as you bend at waist, place both hands on floor between feet shoulder width apart. Pull the scapula up the back and away from the shoulders, elbows out to sides. Inhale, head up, look up between eyebrows, spine straight. Exhale, crown of head towards the floor. Inhale, head up, look up between eyebrows. Exhale, hands to hip joint. Inhale, come up, spine straight. Inhale, arms out to the sides. Exhale, hands on hip joint, fingers pushing into abdominal cavity to emphasize uddiyana bandha, pull the elbows together and lift from the hips, top of head moving towards floor, shoulders away from ears. Inhale, look up to 3rd eye, come all the way up, lengthening from base of spine. Inhale, arms out to sides. Exhale, interlace fingers behind back, palms facing each other. Inhale, look up, open chest pulling arms and shoulders back. Exhale, bend forward, arms over head bringing hands toward floor. Inhale, come up looking to forehead. Modified posture: hold elbows behind back, look directly ahead, spine straight instead of coming all the way down. Bend knees if necessary. Inhale, hands on hips, lift chest, pelvis forward. Exhale, bend forward, hands to big toes pressing roots of big toes down while pulling up with fingers (hold toes with index and middle fingers, and thumbs). Inhale, head up, look up between eyebrows, straighten spine. Exhale, bend forward, top of head towards floor. Elbows bent, shoulders away from ears, arms pulling out to side to bring body closer toward legs, keeping chest open, shoulder blades moving down the back. Inhale, come all the way up, straight spine. Exhale, top of the mat, to Samasthiti. Modified posture: hold back of legs with hands, keep back straight (don’t go all the way down). Inhale, jump feet out 3 ft apart, right foot parallel to edge of mat (90 degrees) left heel turned in (left foot at a 45–60 degree angle). Exhale, hands in prayer behind back, turn hips to right, lift kneecaps. Inhale, look up, open chest. Exhale, press palms together not clasping thumbs or fingers, stretch out and then down, bend from the hips forward over right leg, bring chin toward shin. Pull right hip back so hips are parallel, lift elbows. Drishti: second toe of extended foot. Exhale, turn hips to left, reverse feet. Inhale, open chest, look up and back. Exhale, bend forward over left leg. Hold 5–8 breaths. Modified posture: hold elbows behind back instead of hands in prayer, stay at half way down position with head up, spine straight. Inhale, right leg up, hold big toe with first two fingers of right hand, left hand on hip, right leg straight. Modified posture: hold knee into chest. Inhale, look up, straighten body, keeping leg extended out. Exhale, right leg out to right side, look to left. Inhale, leg back to center. Exhale, take foot with both hands, pull leg toward chest (bending elbow), chin toward knee or shin. Exhale, hands to hips, hold leg extended straight out in front for 3 breaths. With last exhale bring leg down to Samastithi. Repeat other side. Modified posture: keep knee bent as you bring leg out to side and back in to chest. Inhale, place the right heel as close to the navel as possible. Exhale, reach around behind back with right hand and hold onto big toe of right foot. Inhale, lift left arm up. Exhale, bend forward, looking straight ahead, left hand on floor. Inhale, head up, look between eyebrows. Exhale, fold forward, crown of head towards floor. Inhale, head up, look up. Exhale, leg down to Samastithi. Modified posture: hold foot up in half lotus with both hands, 5–8 breaths, don’t bend forward. Or bend forward with both hands to the floor, and knee bent. Inhale, hands up, look up to thumbs. Exhale, forward bend, gaze nose. Inhale, head up, gaze 3rd eye. Exhale, bend knees, jump back to Chaturanga. Inhale to upward dog, lift chest. Inhale, head up, bend knees and jump to top of mat, feet together. Straighten or lift upper body to erect position with knees bent, palms together but not clasped, arms as straight as possible pointed to ceiling. Deepen posture with each breath. With last inhale deepen a half way down towards floor. Exhale, come up and bend forward in a swan dive, arms to sides. Look toward 3rd eye and then tip of nose. Exhale, bend knees and jump back to Chaturanga. From downward dog, Adho Mukha Svanasana. Inhale, step right foot forward between hands, bend right knee to 90 degrees, square the hips, press back heel and outside of foot into floor, as you lift arms up over head, palms together, gaze upward and really emphasize mula bandha. Inhale, straighten right leg, come up and turn around to other side, bend left knee, arms up over head. Inhale, keep the trunk straight, a feeling of being pulled from four directions, revolve hips open to right, arms out to sides looking over middle finger of left hand. Bend left knee, tuck pelvis, lift chest. Press back heel and outside of back foot into floor. Drishti: tip of middle finger. Inhale, come up, straighten legs, revolve around to other side, bend right knee over right ankle, Virabhadrasana B, right side 5–8 breaths. Inhale, arms back up to Virabhadrasana A facing front, look up to thumbs. Exhale, hands to floor on either side of right foot and jump back to Chaturanga. Inhale, jump through to sitting, legs extended straight out. ianus 19.04.2006 - 11:46:32 (modif: 24.10.2006 - 19:19:44), level: 1, UP NEW ! !CONTENT CHANGED!! Sit with legs extended out in front and hands on floor by hips with fingers facing the feet, sitting up with spine straight. Place chin to chest in jalandhara bandha, shoulders rolled open and scapula pulled down the back. Inhale, arms up, look up to thumbs. Inhale, head up, straighten spine, lift chest and look toward 3rd eye. Modified posture: hands to ankles or shins, look up, spine straight. Inhale, head up, look up between eyebrows, lengthen spine, this time hold around sides of feet. Exhale, bend forward, go a little deeper into the posture and bring chin to knees, elbows should be above the ground out to the side, not touching the floor, feet flexed. Inhale, head up, look up, lengthen spine, this time clasp hands all the way around feet. Exhale into a forward bend. In the primary series the vinyasa links the postures together in a flowing series of movements. It helps to maintain the heat as well as realign the body between postures. The full vinyasa is basically one A-salute, coming to standing between postures. For the purpose of this manual we will practice vinyasa between the two sides (right, left) without coming to full standing in between. If you want to work on building strength or increasing the heat, practice full vinyasa, coming to standing between each side of a posture. The first vinyasa is introduced in the primary series after Purvottanasana. From sitting, with palms on floor, cross ankles and lift up. Exhale, swing legs back through arms to Chaturanga Dandasana (if this defies all laws of gravity for you, begin by just lifting your body up and moving in the direction of bringing your legs back through your arms and then step back). Inhale to upward facing dog. Inhale, bend knees and jump legs through arms to sitting with legs extended straight out in front. Again, this is something most of us have to work up to. Begin by jumping crossed legs to arms, then sit and stretch legs out. Progress to coming through with your legs straight. Exhale, place hands 1 ft behind hips, palms flat on floor, fingers pointing towards feet. Inhale, lift body up supporting weight with hands and soles of feet. Tuck pelvis, toes to floor. Arms straight, head back. Lift hips emphatically, bring inside edges of feet together and knees together. Look back and up between eyebrows. Modified posture: if neck feels strained, keep chin to chest. Inhale, bring right heel into the navel before lowering knee to get leg as high up on thigh as possible. Try to keep both shoulders level with each other, pull scapula back and down the spine. Exhale, right arm around behind back and clasp toes on right foot, left index finger and thumb holding left big toe. Exhale, bend forward, staying in half bound lotus, chin to shin or knee. Modified posture: forget half bound lotus! Place right foot onto left thigh and bring both hands to left foot as you bend forward. If right foot doesn’t go on top of thigh, just place foot on inside of left thigh. Exhale through to sitting with right foot by right hip, knees close together, left leg extended straight out in front. Before starting pose, lift flesh of left buttock and make room for the right calf by turning it out a bit with hands. Inhale, arms up, look up. Exhale, fold forward, hold top of foot with both hands or clasp left wrist with right hand around foot. Inhale, look up between eyebrows. Exhale, come forward and down, chin to shin or knee. Work to bring both hips to the floor. Keep both shoulders at same level with shoulder blades moving down the back, elbows off floor. Drishti: big toe of extended foot. Modified posture: place left hand out to side and push to keep right hip down. Or as above, but with a block or pillow under left buttock for support. Inhale, head up, come up. Exhale, right heel into groin, right knee at 90 degree angle, left leg straight, foot flexed. Hold foot with both hands or clasp left wrist with right hand. Inhale, look up between eyebrows, spine straight. Exhale, stretch out from the hips, bend forward, chest on thigh. Pull scapula back while pulling forward with hands around foot. Drishti: big toe of extended foot. Hold for 5–8 breaths. Modified posture: keep head up and bring hands to shin or ankle. Exhale, right heel to groin, then using your palms on the floor lift yourself up and move forward, so you’re sitting on top of your foot with the heel into the perineum. Inhale, hands on left foot, look up and stretch spine up. Exhale, stretch out from hips, fold forward, chest on thigh, chin to shin. Modified: use hands on the floor to support sitting posture with heel into perineum, do not bend forward. Exhale, left leg stretched out, foot flexed. Take right foot in right hand, holding under foot and take your toes with the left hand, place the foot on the floor with the toes flexed on the floor (your hand can hold them flexed as they go down) right next to left thigh, molding the right arch around the left thigh. Lift the hips slightly to bring the body forward so the foot straightens. Inhale, head up, look up holding foot with both hands. Exhale, stretch forward from the hips with chest on thigh and chin to shin. Exhale, pull right knee up with the right foot just in front of the right hip a few inches away from the left thigh. Keep bottom leg straight and flexed. Inhale, reach right arm up to ceiling. Exhale, wrap right arm around leg (low on shin) to meet left wrist behind back. Clasp left wrist with right hand and bring chin towards shin of straight leg, lengthening forward. Exhale, bend forward, head towards knee. Modified: sit straight up holding hands around knee. Exhale, left leg into half lotus, bring left heel as close to navel as possible or into the crease of the right thigh. Right leg extended straight out. Bring right foot towards buttocks, right knee to ceiling. Inhale, right arm up, look up. Exhale, fold forward with shoulder low bring right arm around right leg. Hold left wrist with right hand. Exhale bend forward, stretch spine from hips trying to get chin to floor between legs, stretch arms out and back. Modified: instead of placing left leg into half lotus, place left foot along the inside of right thigh. Do not bend forward toward floor. Keep spine straight, look up. Exhale, right knee up, left leg extended straight out onto floor. Inhale, stretch left arm to ceiling to make room. Exhale, wrap left arm around the right leg with the armpit as close to the knee as possible, clasp the right wrist with the left hand, gently pull to deepen the twist. Pull the right hip towards the floor and straighten the spin as much as possible, with shoulders revolved, trying to make the twist come from the abdomen and waist as well as from the thoracic spine. Modified: twist with right palm flat on floor, left arm along side left shin. Exhale, left leg into half lotus, bring left heel as close to navel and foot as high on the thigh as possible. Bring right knee up towards ceiling, right foot close to right buttock. Inhale, twisting to left, lift left arm to ceiling, look up. Exhale, extend left arm around outside of right knee with armpit over knee, looking to the right. Clasp right wrist with left hand behind back if possible or clasp fingers. Inhale, jump through, without touching feet to floor if possible, to sitting, both legs extended out straight. Exhale, lift legs, arms parallel to floor, lift chest. Modified: bend knees, and/or place elbows and forearms on floor. Exhale, cross legs, palms to floor, inhale, lift up, without touching floor if possible, for one breath. Exhale, buttocks back to floor. Inhale, lift legs back up without touching floor…repeat five times. Inhale, jump legs around arms, palms on floor (to get farther into pose, take a moment to work shoulders under knees, keep hips lifted). Exhale, sit back, cross feet in front. Modified: keep buttocks on floor and stretch legs around arms, knees bent, palms flat. Inhale, head up, balance legs on upper arms, extend feet straight out, toes pointed; Tittibhasana – flying insect posture. Exhale, bring one leg at a time back so that knees are resting into upper arms. Inhale, head up, look up, lift mula bandha; Bakasana – crane posture. Inhale, jump feet around arms. Exhale, bend arms and lower buttocks to the floor. Inhale, head up, extend legs straight with backs of knees high up on arms, pressing through heels. Arms stretched out to sides underneath legs. Chin to floor, chest to floor. Modified: keep knees bent and chest lifted, you’ve got the rest of your life to get your chest to the floor. Inhale, head up, bend knees, bringing feet in towards each other. Cross right foot over left. Bring shoulders under knees. Exhale, slide hands around behind back until underneath legs and clasp them together. Modified: skip it until you can get your chest to the floor without feeling pain in your back. Exhale, lift up to Tittibhasana. Inhale, fold legs into lotus, right leg first. Bring the feet as high up on the thighs as possible, push knees closer together. Exhale, slip hands through space between thighs and calves so that arms are through legs up to elbows. (Slip right hand through hole first starting with the palm down, then rotate the palm upwards about a half way through, use your left hand to bend right elbow and bring it farther through. Repeat with left hand.) Bend arms and place hands in prayer in front of chest, or place chin in palms of hands. Inhale, rock and roll; roll backwards and forwards in a full circle, backwards on the exhale and forwards on the inhale. Repeat roll nine times. Modified: hold either crossed legs into chest or just bend knees and bring knees into chest, then rock and roll around in circle. Note: Spray insides of elbows and knees with water to facilitate posture. Inhale, roll up, place palms flat on floor (still with arms through legs), lift bottom and knees off floor and then balance. Modified: inhale, roll up, place palms to floor by hips with legs crossed, lift up if possible. Inhale, bring feet in towards perineum, hold feet with hands and open soles out to ceiling. Let knees move down towards the floor as hips open. Bring chin towards chest. Lift chest. Sit up straight. Exhale, bend forward and bring chin and chest to floor, lengthen from base of spine. Exhale, bend forward, lengthening spine as you bring chin and chest to floor. Drishti: nose, or 3rd eye if deep into pose. Modified: hands to ankles, shins, or knees. Keep spine straight and look directly ahead, lift chest, do not bend forward. Ixhale, roll over, chin and chest to floor again, landing on calf muscles. Drishti: nose or 3rd eye. Inhale up, exhale, jump back to vinyasa. Exhale, rock back, lift legs over head to floor with legs spread wide, fingers inserted between big toes. Inhale, rock up, pause with legs up. Exhale, roll over, chin and chest to floor again, landing on calf muscles. Inhale, bring right leg up holding onto right big toe with first two fingers and thumb of right hand. Leg should be as vertical as possible. Place left hand on left thigh, head down. Exhale, lift up so chin comes to right knee. Modified: right hand on shin or behind knee. Exhale, head down. Take right leg out to the side, bring heel to floor, turn head to look over left shoulder. Left hand on left thigh, legs straight. Inhale, bring right leg back to center, holding onto big toe with both hands. Exhale, chest to thigh, chin to shin. Add a split at end, pulling leg to floor over head. Inhale, head and leg down. Inhale, bring both legs over head so that the toes touch the floor holding onto big toes with thumbs and first two fingers of each hand, chin to chest. Inhale, roll up to balance on tailbone and sit bones, arms and legs extended, head back, look up. Modified: bend knees as you come up to balance on tailbone and slowly straighten legs, or just keep them bent. Lift chest. Inhale, bring both legs over head, toes to floor holding outside edges of feet with hands. Hold one breath. Inhale, roll forward and up, pull chest to thighs. Modified: keep knees bent as you roll up to balance, hold onto ankles or calves. ianus 19.04.2006 - 11:46:00 (modif: 24.10.2006 - 19:20:46), level: 1, UP NEW ! !CONTENT CHANGED!! Inhale, bend knees, bring feet in towards buttocks, heels together, toes pointed outwards. Using elbows for support, lift chest off floor. Exhale, tuck pelvis and lift hips upward, rolling head so that the balance is now on the head and feet. As you roll onto head straighten legs so that they are extended. Modified: instead of coming up onto head, keep knees bent and feet parallel, resting weight evenly on shoulders and feet (flat to floor). Lift pelvis upward and keep shoulders and feet on floor. Exhale back down to lying on floor, bending knees open as you come out of the posture. Exhale, bending knees bring feet in towards buttocks, feet firmly planted and parallel. Place palms onto floor by ears, fingers pointing towards feet. Inhale, press up lifting pelvis and straightening arms and legs. Head hanging, neck long. Breathe! Mulabandha is key here. Drishti: 3rd eye. Modified: start with modified Setu Bandhasana as above and slowly progress to back bend by placing crown of head on floor first. Eventually work your way yup to back bends after a few weeks. Exhale, come down, shoulders to floor, then roll spine down to floor. Repeat 3X, resting for a couple of breaths between back bends. ianus 19.04.2006 - 11:39:10 (modif: 24.10.2006 - 19:21:39), level: 1, UP NEW ! !CONTENT CHANGED!! Begin from sitting position, legs extended straight out in front, hands by hips. Exhale, bend forward, hold onto sides of feet, or clasp wrist with hand. Inhale, head up, lengthen spine. Begin from a lying down position. Exhale, lift legs over head, toes to floor. Place hands on back as close to shoulders as possible. Walk elbows in towards each other. Chin to chest. Inhale, raise legs directly over head, supporting back with arms and hands, work the hands farther down the back closer to the shoulders with elbows close together. Relax your face! Hold for 5–8 breaths and gradually increase to 25. Modified: keep most of the weight on arms and elbows, bend knees if neck feels compressed. Use padding under shoulders if you have any neck problems. Exhale, bring legs over head to floor. Feet together, toes pointed. Interlace fingers behind back and bring hands to floor. Spine straight. Drishti: nose. Modified: support back with hands and keep knees bent. Come part way up pand over as far as possible. Exhale, bring knees to floor by ears, press the knees into ears and down into floor. Keep hands to floor behind back, spine lengthens over. Drishti: nose. Modified: knees to forehead, hands supporting back. Inhale, back up to shoulderstand, hands supporting back. Look to toes. Exhale, put legs into lotus, right leg first, push up on knees with hands, straightening the arms. Modified: place soles of feet together in Baddha Konasana, with knees out to sides. Continue to support back with hands. Exhale, bring knees towards chest in full lotus, wrap arms around thighs and clap hands together. Drishti: nose. Inhale, take palms to floor along mat, arms straight. Bring legs down to floor still in full lotus. Exhale, using elbows for support, lift chest and bring top of head to floor. Hold onto feet or big toes and lift chest so that all weight is supported by buttocks and crown of head. Modified: place soles of feet together, knees open to sides. Lift chest, but support with elbows. Inhale, release legs and extend them straight up 45 degrees to the floor. Extend arms up parallel to legs, palms together. Drishti: 3rd eye. Modified: lay back on floor, lift legs. Come through to a kneeling position. Inhale, create a triangle with your hands and arms; interlace fingers with heels of hands, forearms and elbows on the floor, elbows shoulder width apart. Exhale, crown of head to floor, palms facing back of head, thumbs lightly touching head. Inhale, walk feet in towards torso until toes lift off by themselves and keep back straight. Exhale, legs straight, inhale to lift legs up slowly. Most of the weight should be on elbows, forearms, and heels of hands, not on neck and head! Hold for 25 breaths. Begin with 5 breaths and work your way up to 25. Inhale,slowlylowerlegsuntilthey’reparalleltothefloor,holdfor5breaths. Look to big toes. Inhale, raise legs all the way up for one breath. Exhale, lower legs to the floor. Sit back in child’s pose, buttocks on heels, arms along sides, forehead to floor. Modified: rabbit posture, begin on hands and knees, bring crown of head towards floor and hands to ankles. Lift hips towards ceiling. Inhale, come up to sitting. Inhale, right foot up into half lotus, get heel as close into navel and right foot as high on left thigh as possible. Exhale, left leg over right into full lotus, push knees closer together. Inhale, lift left arm up and around to make space before taking it behind back, grasp left foot, push left elbow toward the toe with the right hand to make more room. Exhale, lift right arm up and around to make space before taking it behind back and grasp right foot (you can let go of left foot a moment to enable grasping the right). Inhale, look up, lift chest. Exhale, fold forward, chin to floor. Modified: sit cross legged, interlace fingers behind back, inhale head up, exhale head towards floor. Inhale, hands to knees, forefinger and thumb touching (Yana mudra, the Seal of wisdom). Exhale, lift chest move shoulders away from ears, bring chin toward chest. Sit straight. Engage bandhas and listen to the breath. Drishti: nose. Modified: sit with legs crossed. Inhale, press palms to floor, still in full lotus. Exhale, lift up off floor, knees up. 25 fire breaths — intense breathing , belly moving. Modified: legs crossed, palms to floor without lifting up. Come through to lying down on back. First with everything flexed, alive. Feet flexed, palms facing down, shoulders moving away from ears. Then slowly relax here, arms by sides, palms up for at least 10–20 minutes. The finishing series has a two fold importance. The first aspect is to give us an opportunity to experience the effect of the practice we did. We feel an incredible level of awareness. Our spine is like an antenna at this point. It is able to receive the realization of truth beyond the realm of sensory perception as we work on memory, intuition, and imagination. We are ready to understand more clearly our nature and can put into action the forces and mysteries for our growth and development by synchronizing our inner and outer rhythms. We are at the most perfect place to express our consciousness. It is a time to experience quietness sand when we sit we start to see that we only perceive a little of reality. The second aspect is to connect with the big picture. Where our rconscious and unconscious are interweaving we see that yoga aoffers us a practice method to create a state of unification. We econnect with our divine nature. The realization of the divine sets sus free. We practice yoga to go beyond our mind function, to expand our consciousness, to have a quieter inner dialogue, to feel peace and one pointedness. Practice leads us to unity of thoughts and actions, gives us a sense of cleansing the mind and provides us inner silence. It offers us guidance, creates non attachment, and insures better mental and physical health. Receive the fullness of your practice. ianus 19.04.2006 - 11:25:12 (modif: 26.09.2007 - 20:35:04), level: 1, UP NEW ! !CONTENT CHANGED!! Once you have an understanding of the individual postures, you can begin to link your postures one to another using smooth, deep ujjayi breathing to initiate the movement and create a continous unfolding of asanas. The asana drawings with their drishtis are shown on the following pages, so you can open the book and have it handy as you learn and practice. Symbol you’ll need to know: ◆ Drishti.